Being a Canadian, I have always wanted to read a book about this tragedy. Finding it available in audiobook from my library made it a great time to listen to it and I am very glad I did. It will not be for everyone, but a must read/listen for any Canadian. The book opens with an amazing Christmas Tree being gifted to the people of Boston. It is done every year since the explosion, a simple thank you for everything they did to assist Haligonians in this terrible time. This book tells what is happening in the world at the time and how it relates to what happened, or how it was directly involved in the happenings. Some of this is a bit dry, but it is the courageous, heroic, and morally astounding stories and selfless acts of goodwill and generosity that happened after this catastrophic event that make this book. Hearing the stories leading up to the explosion, during the event and afterwards were heart breaking. So many lives lost or crippled forever. So many families wiped out. But, human nature tells us to rise up, band together and help one another and that is what happened, not only from Boston, but all over the world. This is that story. 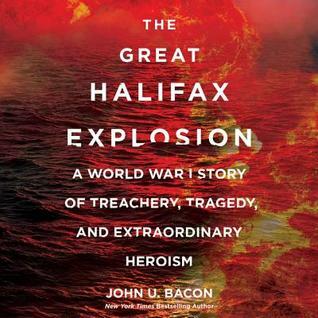 About the Book: From New York Times bestselling author John U. Bacon, a gripping narrative history of the largest manmade detonation prior to Hiroshima: in 1917 a ship laden with the most explosives ever packed on a vessel sailed out of Brooklyn’s harbor for the battlegrounds of World War I; when it stopped in Halifax, Nova Scotia, an extraordinary disaster awaited. . . . In this definitive account, Bacon combines research and eyewitness accounts to re-create the tragedy and its aftermath, including the international effort to rebuild the devastated port city. As he brings to light one of the most dramatic incidents of the twentieth century, Bacon explores the long shadow this first “weapon of mass destruction” would cast on the future of nuclear warfare— crucial insights and understanding relevant to us today. About the Author: John U. Bacon has written for Time, The New York Times, and ESPN Magazine, among other publications, earning national honors. 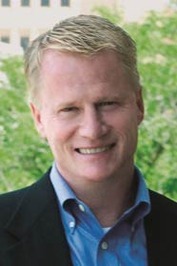 He is the author of five books on sports and business, including Three and Out, Bo’s Lasting Lessons (with Bo Schembechler), a New York Times and Wall Street Journal business bestseller. Bacon teaches at Northwestern University and the University of Michigan and is a popular public speaker. What a horrible tragedy. So many things happened in war that the average person isn’t aware of. Thanks for sharing Carla. I had always heard of this event, but had no idea it was all part and parcel of the war effort. It is an amazing yet sad story. Thanks Jenn. Some of the details were horrific, but the human strength and resilience was amazing. Sounds like an amazing story. I am definitely going to include this one onto my TBR. I hope you enjoy it Marialyce, it was very hard to listen to at times, but I learned a lot. You’re welcome Mackenzie. It was a subject that I was long overdue reading about. I have been given a names of a couple more to pick up, but I will need to take a break. This sounds so wonderful! I’m realizing that I’ve always love the era from 1880-1925, basically what we call the “Victorian era” but it’s not really, and I’ve read so many books set in that time frame but I never read books, fiction or non, about WWI. When I read Dead Wake, it opened my eyes to a whole new world and now I simply cannot stop reading books set during that time. So, all of that to say, I’m adding this one to the list. Thanks! You know I had to check out Dead Wake and it looks like one I will need to read. There are not a lot of book written about WWI, but there was so much going on. This book is not so much about the war, but the war is the background and of course the munitions that caused the explosion were heading to Europe. I hope you enjoy this one. Have you read The War Horse? I know it is a YA/Middle grade book, but I really enjoyed it. I want to listen to this, too, Paula. I love nonfiction on audio. This sounds like a tough but captivating read. Wonderful review! Thanks Jenn. I hope you get a chance and that you “enjoy” it. I always have a hard time saying I enjoy these books. I don’t think I could have read this one without skimming whole sections, but the personal sections had me riveted. I was lucky the library had it on audio. Windsor is about 4 hours southwest of Toronto. I am just across the river from Detroit, Michigan. I travel to Toronto 5 or 6 times a year to go to the theatre. It is our New York City. I love, love, love Toronto. I wish I had gone more often while we lived in Erie, PA. Niagara Falls, too. Population is around 200,000, so on the larger side, but not huge. I might know your triplet mom, since I was a teacher for so many years unless she only started teaching in the last 8 to 10 years. Yes, Erie was pretty close. I love Toronto to visit, but could never live there, way too fast paced. I am sure you have heard about this tragic even all your life Lynne. I had always heard about it, but never knew about it, if that makes sense. An important part of history that I was unaware of. I’m glad you shared this. There are a lot of people that are not familiar with this tragedy. It happened so soon after the Sinking of the Titanic where so many victims were buried in Halifax. So much history shared in this book. Your review was very well done (as usual).